Tacos are more than beef, tomatoes, and cilantro. You can get tacos with all different kinds of ingredients. 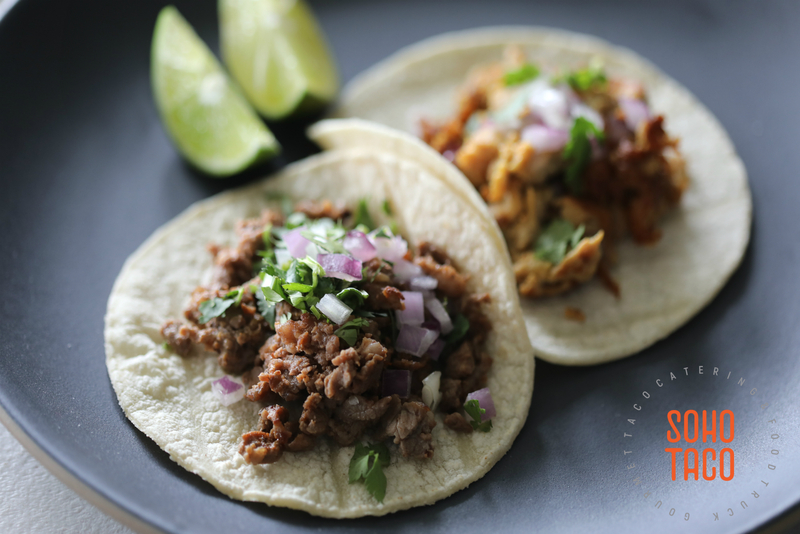 Check out today’s blog to learn more about the types of tacos. There’s no doubt about it—tacos are a beautiful, delicious treasure of food. With countless varieties from origins all across Mexico, there’s a taco out there to suit every set of taste buds. Why settle for the same basic fillings every time when there are so many options to choose from? The next time you’re hungry, try out one of these types of tacos instead. 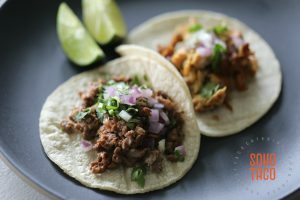 The modern American definition of “taco meat” is pretty much synonymous with spiced ground beef. However, that wasn’t always the case. From sausage to bone marrow, traditional meat fillings are as varied as the spices they’re cooked in. Our signature carne asada and pollo asado tacos. Literally meaning “grilled meat,” carne asada is the classic steak taco. This cut of steak is thinly sliced and is often marinated in citrus, cumin, and other spices. If you’re not as interested in red meat, pollo asada may be the one for you. These tacos consist of thinly cut or shredded grilled chicken marinated in a similar spice mix. Either way, asada tacos are best served with fresh salsa. Tacos Al Pastor, or “shepherd style” tacos, are actually a fusion of Mexican and Lebanese cuisine. When Lebanese immigrants arrived in Mexico in the early 1900s, they shared their technique of spit-roasting lamb meat for shawarma. Tacos al pastor took that method and applied it to pork. The pork is first marinated in a mix of chiles and spices, then slow-roasted on a spit until the outside is crispy and the inside is tender. It’s usually served with pineapple on top, creating a sweet and spicy flavor combo that can’t be beaten. Another pork-based favorite, tacos de carnitas (“little meats”) are made of shredded pork shoulder. The meat is braised or slow-cooked in its own fat until it falls apart. The shredded bits get slightly crispy on the ends, lending carnitas their distinctive texture. Chorizo is Mexico’s take on a traditional Spanish sausage. Whereas Spanish chorizo is generally smoked and cured, Mexican chorizo is sold fresh. This blend of minced meats is often pork-based and is heavily seasoned with chiles. For tacos, the sausage is removed from its casing and served loose, often with fresh salsa or pico de gallo. There are many different types of tacos de cazuela (“casserole”), but the ones from Oaxaca, Mexico are unique. They start with a base of a corn tortilla spread with refried black beans. The black beans are seasoned with anise, a spice known for its licorice-like flavor. These tacos are then loaded up with avocado, salsa, and a guisado (stew) made of a variety of meats. If you’re feeling a little adventurous and you’re in the mood for a rich, buttery delicacy, tacos de tuetano may be the ones for you. These tacos are filled with roasted beef bone marrow that melts in your mouth. Their intense flavor is complemented by a simple corn tortilla and a squeeze of fresh lime. Fancy the surf over the turf? The coastal regions of Mexico have gifted us with some seriously delicious (and adventurous) seafood options. Tacos de pescado (fish tacos) have gained a lot of popularity throughout America in recent years. They are typically made with a fried or grilled white fish such as tilapia or mahi-mahi, though camarones (shrimp) are also used. Tacos de pescado come with a variety of toppings such as fresh greens, pico de gallo, and cream-based sauces. Tacos de guisado are traditionally filled with a base of stewed meats such as chicken, beef, or pork. In the coastal regions of Mexico, where seafood is more plentiful than large livestock, the guisado is often made from the catch of the day. Seafood tacos de guisado can be filled with anything from stewed sea urchin to manta ray and freshwater gar. Vegetable lovers, never fear! Even though most traditional tacos are meat-based, there are plenty of exciting vegetarian options to try out. Tacos de vegetales filled with a mix of grilled and seasoned vegetables. These tacos are traditionally made with whatever produce is grown locally. The vegetables can consist of anything from grilled peppers and onions to asparagus, corn, and potato. “Quelites” is the general name for a variety of wild leafy greens native to Mexico. The Quelites are either stewed or sauteed in a variety of spices and served on a hot corn tortilla with other grilled vegetables. If you’re a fan of dark leafy greens like spinach and kale, you’ll definitely enjoy tacos de quelites. Huitlacoche, also known as “corn mushroom” or “Mexican truffle,” is a fungus that grows only on organic corn. It’s nearly impossible to find fresh huitlacoche in the USA—most come either heated or canned. The taste is often described as earthy, smooth, and similar to mushrooms. Because they require skinning a cactus, tacos de nopales are arguably the most dangerous taco style on this list to prepare. Nopales, or commonly known as prickly pears, are found everywhere throughout southern Mexico. The cactus paddles are first stripped of their spines and then sliced up and sauteed with citrus and spices. Served with guacamole, roasted corn, and fresh salsa, this taco’s unique flavor is sure to be a hit. Which Types of Tacos Will You Try Next? No matter what types of tacos you’re craving, Soho Taco has you covered. Our wide selection of gourmet tacos and appetizers has something for everyone, making us the perfect choice for your next event. Don’t wait ’til Tuesday to get your hands on a new and exciting taco! Contact us today to get a quote for your next catered event.